Below is a list of private companies contracted by the U.S. State and Defense Departments in 2009 to carry out activities related to U.S. military and police aid to Colombia. The source is an annual report (4.78MB PDF file) required by section 694(b) of the 2003 Foreign Relations Authorization Act. The total amount of funds contracted out in 2009 was US$216.7 million, significantly less than the US$309.6 million total in 2006, documented in the last version of this report that we obtained. This reflects an overall decline in military assistance to Colombia since that year, when such aid was near all-time highs. The US government is spending million of dollars for military operations and police securities. They are one of the most powerful and advanced team in terms of facilities, training and intelligence all over the continent and worldwide. They must ensure that these funds will go through legal operations and not on the illegal ones. “Preach What You Practice” is available as a PDF in English. We haven’t finished laying out the Spanish version — we hope to have it by Friday — but we can share the Spanish text right now. The report, Preach What You Practice: The Separation of Military and Police Roles in Latin America(PDF), from the Washington Office on Latin America (WOLA), provides a background briefing on key distinctions between military and police functions. It calls on the Obama Administration to change direction, and stop encouraging the military forces of other countries to take on roles that would be illegal for the U.S. Armed Forces to carry out at home. The authors, a team of WOLA’s regional security experts, set out specific steps to be taken by both United States and countries in the region. 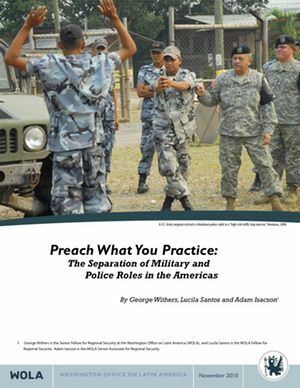 Preach What You Practice (PDF) recommends that U.S. interactions with Latin America’s militaries adhere to the principle that has benefited democracy in the United States so greatly for 130 years: the clear separation of military and police roles. This means zeroing out military assistance that encourages the use of soldiers against citizens. It also means devoting more assistance to build strong justice systems, police, local governments, oversight bodies and other civilian security institutions that democratic governments need to be able to contend with rising violence and organized crime. It is very hard to square this with the statements of Major General Henry Rangel Silva, head of the Venezuelan Armed Forces’ Opertional Strategic Command, made in an interview publishedMonday in the Caracas newspaper Últimas Noticias. In the interview Gen. Rangel, who coordinates “Plan República,” the Venezuelan armed forces’ election security and protection operation, lashed out at President Chávez’s political opponents. For many [opposition figures], there are some military leaders who aren’t suitable, and they say, ‘we have to get them out of the way.’ … They [the opposition] act with the support of third governments, and that affects nationalism. The hypothesis [of an elected government led by today’s opposition] is hard to swallow, it would mean selling the country, and that is not going to be accepted, not by the armed forces and much less by the people. 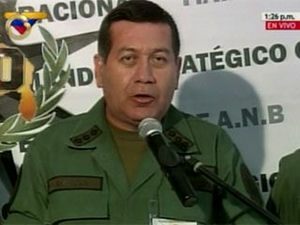 In the National Assembly, which until the end of the year has a near-unanimous pro-Chávez majority, the body’s first vice president, Darío Vivas, voiced his support for the General’s statement, characterizing it as an expression of military loyalty to President Chávez, their commander in chief. Such committees should be formed to hear the problems faced by the common man in the nation. A common man is surrounded by tons of problems externally, which lurks to steal their peace, their money, their work and consider them just like an animal for prey. The Orion Code system that has been doing this should be taken into action, charges for cheating innocent people and a legislation to be passed to destroy such systems. A tougher stance toward leftist governments, especially Cuba, Venezuela, Nicaragua and Bolivia. Legislative efforts to soften the Cuba trade embargo or travel ban will face huge obstacles. Expect more resolutions, legislative language and hearings criticizing human rights abuses, evidence of democratic weakening, ties to Iran and other non-democratic regimes, or increased narcotrafficking activity in Venezuela or Bolivia. Movement on “free trade.” Expect a push to approve the pending U.S. trade promotion agreements with Colombia and Panama, which the Obama administration says it also supports. This push could be delayed or weakened, however, if unemployment remains near 10 percent – U.S. public opinion tends to believe that free trade costs jobs – or if the new “Tea Party” Republican representatives turn out to be as protectionist as they are nationalist. Calls, from some quarters, to increase “Drug War” aid. Before losing their majority in 2006, House Republicans were among the most energetic advocates of “Plan Colombia” and similar mostly military-and-police aid programs in the hemisphere. Later, from the minority, they strongly supported the Bush administration’s mostly military-and-police “Mérida Initiative.”Key Republicans are likely to call loudly for more military and police aid to both countries to fight drug production and transshipment, and may perhaps seek to weaken human rights contitions applying to this aid. They will probably not succeed in increasing dollar amounts by much. The House leadership appears committed to shrinking the overall foreign aid budget substantially, leaving little room for “Drug War” aid increases. The Obama administration is seeking to orient such aid more toward civilian institutions. Combine these factors with some Republicans’ stated distrust of the Mexican government, and military and police aid may stay close to current levels. Rep. Granger, a moderate conservative and one-time mayor of Fort Worth, has little record on Latin America policy. Her subcommittee writes the “first draft” of the annual foreign aid budget bill, deciding which countries get what kind of aid, and under what conditions. The House foreign aid bill must be reconciled with the Senate’s bill, which is initially drafted by a subcommittee chaired by Sen. Patrick Leahy (D-Vermont). Leahy has been a leading advocate for human rights and development assistance in the Americas.